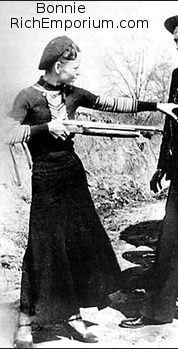 Click to enlarge image Bonnie Parker and Clyde Barrow were two of the 1930s most notorious figures, embarking on a robbery spree through Missouri, Texas and Oklahoma. Both from west Dallas, Texas, they appealed to many Americans as purveyors of revenge against the rich. Clyde was a poor Texas farm boy whose prior brushes with the law included theft of turkeys and late return of a rented auto. Bonnie was a proper Texas honor student with literary ambitions (see Bonnie's poems The Story of Bonnie and Clyde and Suicide Sal . ) Their assaults on the banking industry and finally on the Texas Department of Corrections in engineering the Eastham prison breakout practically guaranteed their final bloody end on a Louisiana road in 1934 where they were killed by Frank Hamer who was a Texas Ranger. Their exploits led to changes in interstate jurisdiction laws and insurance company payout regulations. We each of us have a good "alibi"
For being down here in the "joint;"
Being spent on a "downright cur,"
As long as I've stayed on this "island,"
And heard "confidence tales" from each "gal,"
The story of "Suicide Sal." To play on the "up and up." Before she was turned out "free,"
I was taught that "rods are rulers"
And "ranked" as a greasy cowboy. There I fell for "the line" of a "henchman,"
A "professional killer" from "Chi;"
I was taught the ways of the "underworld;"
Jack was just like a "god" to me. To get the "inside lay" of the "job;"
The bank was "turning big money!" It looked like a "cinch" for the "mob." From where they forced him to the floor. For the "dramatic stunt" pulled on the "teller"
Looked to them too much like a "game." The "police" called it a "frame-up,"
Said it was an "inside job,"
Or dealings with "underworld mobs,"
When Uncle Sam starts "shaking you down." I was charged as a "scion of gangland"
And never one "squawk" did I make. That we make a "sensational break." 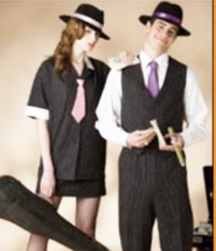 That Jack and he "moll" had "got over"
And were living in true "gangster style." Or "flatten" this fifty years. Tomorrow I'll be on the "outside"
I'll "bump 'em" if they give me the "hotsquat"
Who at last had a chance to "fix it." That a gal on the East Side got "hot,"
Two of gangdom were found "on the spot." Of a "jilted gangster gal."